Let me see how close I am... You woke up this morning, made a cup of coffee, maybe scrolled through your Facebook feed read the newspaper, stopped your children from chucking puzzle pieces at the cat watched your children build a puzzle together, even binge-watched four seasons of Parenthood on Netflix caught the tail end of a fascinating documentary on the History Channel. But then you started thinking about how to structure your literacy block for the upcoming school year, because well, you are a teacher, and teachers can only not think about school for so long. So of course you browse through Pinterest go directly to The Thinker Builder blog looking for some inspiration, and you click here. Regardless, I'm here for you. 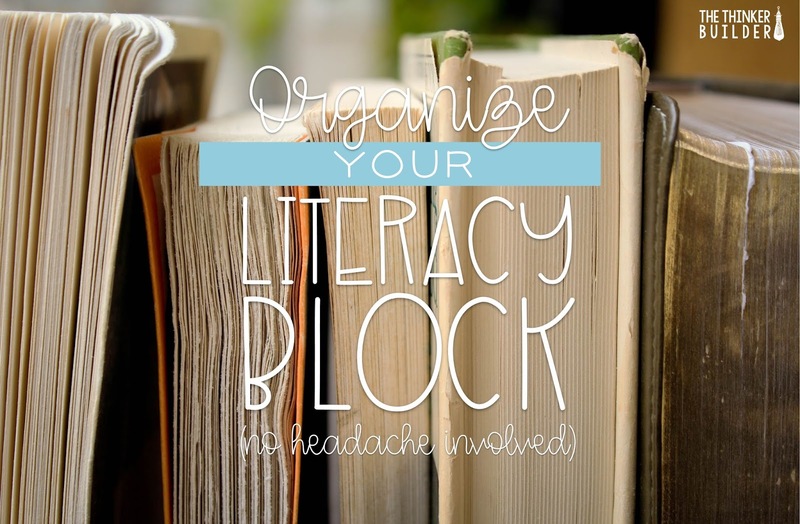 Let me be your sounding board as you continue thinking about setting up your literacy schedule, and I'll help you stave off the headache from too-much-to-think-about-at-once. Now grab this free planning template and a pencil and let's get started! I believe the biggest factor in becoming a strong reader is to read. A lot. I believe in meeting each student where they are, as readers and as writers, and coaching them forward. I believe in using authentic, engaging texts. 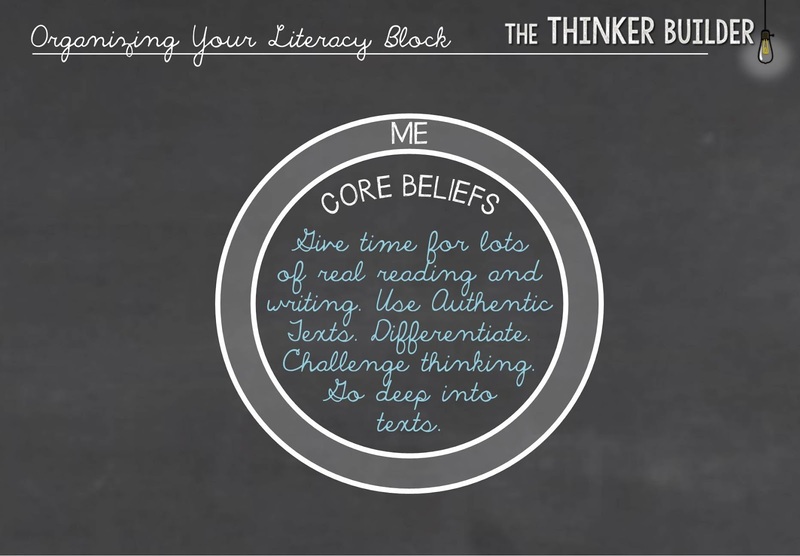 I believe in pushing students deeper into a text, both read and written, than they are comfortable with, in pushing them to challenge their own thinking and that of others (respectfully), and I believe in doing so by modeling these practices myself. Jot down some key words and phrases inside your "Me" circle. Take a minute and think about the influences surrounding the decisions you are about to make regarding your literacy day. This is going to help us approach from the right direction. Think about curriculum already in place, administrative/district demands, literacy frameworks (e.g. Daily 5, Reader's Workshop), state standards, but don't lose sight of your core beliefs about reading and writing. 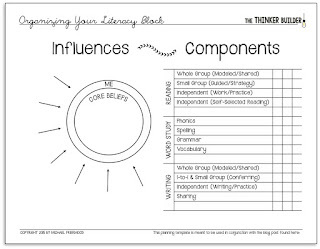 It's time to list the actual components that may comprise your literacy block. For now, don't think about how much time to devote to each part, or even if you have the time for it. Let's use a balanced literacy approach to get started, with pieces for reading, word study, and writing. I've pre-filled many components onto your planner. 3 stars: Vital. Non-negotiable. Reserved time daily. 2 stars: Needed. Important. Daily or almost daily. 1 star: Helpful. Two to three times per week, or integrate into other pieces. 0 stars: Extra. Only do when needed. Let's start filling in a possible schedule now. On the planner, I've laid out a flexible horizontal grid. Think of it like a football field, but instead of five-yard increments, we have five-minute increments. You can see above that I had 140 of literacy, with a break at the 120 minute mark. Think about the amount of time needed for each component in relation to other components. For example, keeping in mind my core beliefs, influences, and priorities, I know that however many minutes I devote to writing lessons, I need to devote more time to students actually writing. Use your breaks as natural transitions. Does a component naturally fit into a certain slot? What "pairs well" together? For example, I like to have a Small Group/Daily 5 session back up against my Whole Group Reading lesson, to set up an opportunity for students to apply what they just learned. Keep in mind the number of transitions you create. Each transition takes time, especially if students get up and move to a different setting (e.g. desk to carpet), but it can also serve as a natural brain-break. 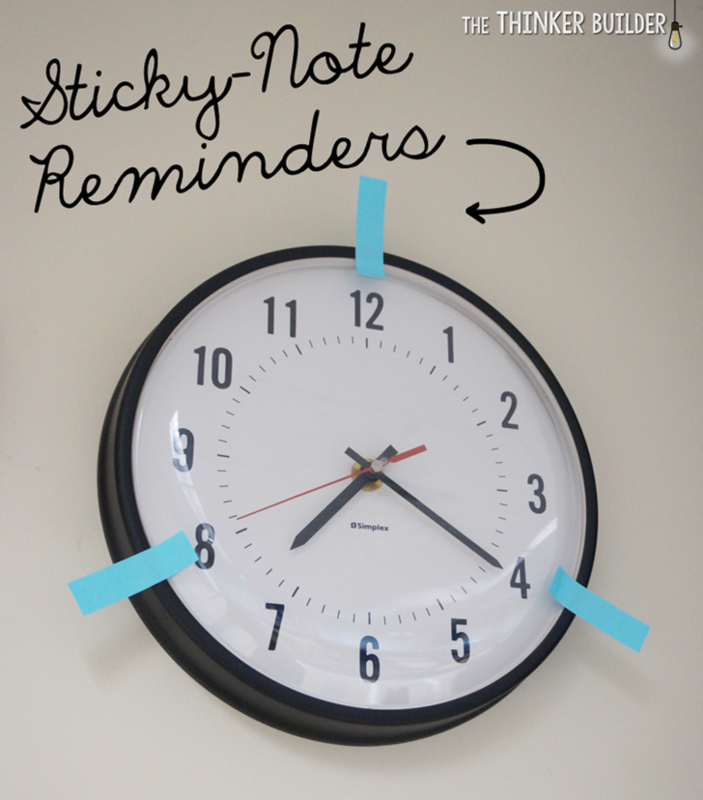 Don't forget about time for assessments. It might not directly change your daily schedule, but most of us give weekly, or at least bi-weekly assessments of some sort, which could affect the schedule for those days. 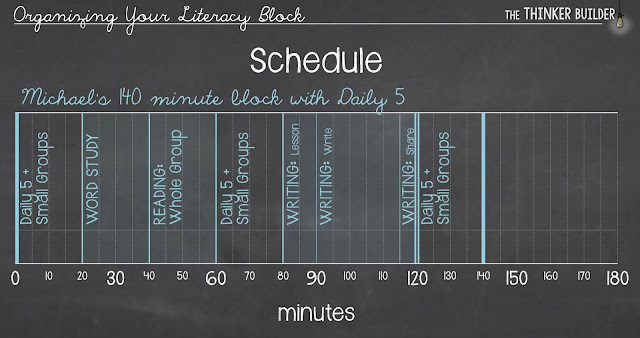 Below is how I filled in my literacy block, using three Daily 5 sessions. I put together some alternate sample schedules for you to look at. This next one uses 140 minutes, but with a Reader's Workshop framework instead of Daily 5. Here is a sample schedule for 120 minutes, using Daily 5. Another way would be to have two longer rounds of Daily 5 (20-25 minutes each) instead of three shorter rounds (15 minutes each). And here's a version using Reader's Workshop. 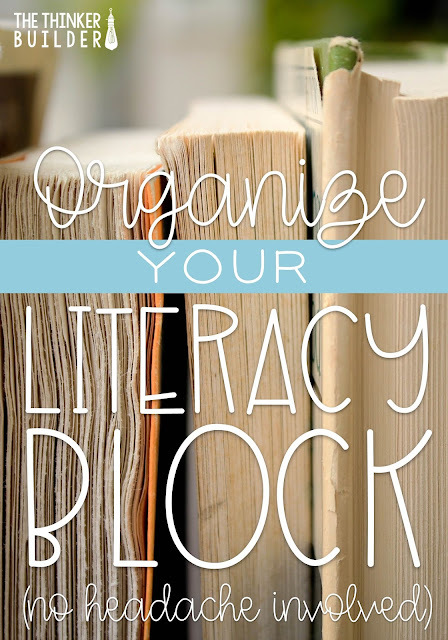 Most of us don't dive right into a regular literacy block schedule the first week of school. My district uses a hybrid of the "First 20 Days" approach (a Fountas and Pinnell thing) to set up procedures and routines and build stamina (in a Daily 5 sort of way, for me), as well as work through beginning-of-the-year assessments. So during those first couple of weeks, as you get to know your students, bounce that knowledge off of your schedule ideas. Do you have an extra wide range of abilities this year? Maybe decrease minutes for whole-group lessons and increase minutes for more differentiated instruction. Once you get started with your regular schedule, time management can be tough. I have the most trouble being concise with my whole group lessons. No big deal every now and then, but running 10 minutes over can easily become the norm. My extremely low-tech solution to help myself stay on track with our schedule is to simply put sticky-notes directly onto our classroom clock.